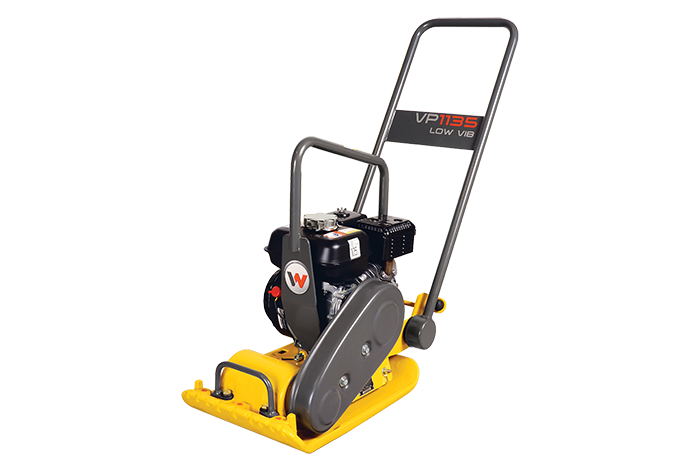 The Wacker Neuson vibrating plate perfect for getting into those tight narrow spots to compact a variety of surfaces. The water tank ensures that the VP1135A is suitable for jobs on both hot and cold asphalt. Powered by the super durable and reliable Honda engine you know that this machine is going to work day in day out with no questions asked. 4-Stroke technology also means no fuel mixing, removing the fear that comes with 2-stroke that someone might straight fuel the machine! The vibration dampened handles ensure that the operator does not get as fatigued while operating this vibration plate as they would using others. Meaning more work can be done and jobs can be completely more quickly. Also equipped with specially designed exciter bearings reducing maintenance and improving productivity. This model is also available without the water tank if you desire. From drive engine via centrifugal clutch and V-belt directly to exciter which transmits centrifugal force onto the baseplate.